Diabetes and obesity top health news headlines and policy agendas around the world. Diets rich in fish and omega 3 from fatty fish oils can have a significant impact on diabetes incidence rates and weight loss according to the findings of several long-term, international health studies. If you want to shed pounds and lower your risk of type ii diabetes, eating several servings of fish per week looks like a good health habit to adopt. Diabetes and obesity are two of the biggest public health concerns in many countries around the world. Both conditions increase the risk of serious health problems like heart disease and stroke, shorten life expectancies, and take a physical and psychological toll on quality of life and self-esteem. Lifestyle changes that accompany development and urbanization tend to bring about higher rates of obesity and diabetes. Together, diabetes and obesity affect the lives of more than 600 million people or roughly 10 percent of the world’s population. As of 2006, more than 155 million children were also overweight or experiencing childhood obesity. After revising the definition of obesity to adjust for ethnic differences, the World Health Organization (WHO) and International Obesity Task Force arrived at a total of more than 1.7 billion people worldwide. Diabetes affects more than 285 million people globally according to estimates by the International Diabetes Federation (IDF) and IDF Diabetes Atlas. With seven million people developing diabetes each year, that number is expected to grow by more than 50 percent in the next 20 years to 438 million people. Formally known as diabetes mellitus, the condition refers to a group of metabolic diseases in which a person experiences high blood sugar either because the body does not produce enough insulin or cells do not respond to the insulin that is produced. The disease comes in two forms: type i and type ii (otherwise referred to as type 1 and type 2). Type i diabetes is a genetic condition usually prevalent from birth that results from the body’s failure to produce insulin and requires diabetics to regularly self-administer insulin injections. Type ii or adult-onset diabetes refers to a condition usually developed over time that results from insulin resistance whereby cells fail to use insulin properly. Type ii diabetes is by far the most common form of the disease, affecting roughly 90 to 95 percent of the U.S. population of diabetics. Adults with a Body Mass Index (BMI) over 30 are generally considered obese. BMI can be calculated by the formula: weight (kg) / [height (m)]^2. The developing world is used to associating health problems related to food with issues of malnourishment and being underweight rather than obesity. In recent years, rapid development and urbanization have given rise to greater concerns about growing numbers of overweight and obese people. In 2006, the number of overweight people in the world overtook the number of malnourished, underweight people for the first time. The chart below from the United Nations Food and Agriculture Organization shows the population portions that are under- and overweight for developing and developed countries. As people move to cities and adapt to urban living, they fall prey to the demands of more hectic lifestyles and temptations of modern conveniences. Urbanization gives rise to changes like less healthy eating habits and reduced physical activity. Fortunately, active efforts to practice healthy lifestyle and eating habits can be rewarded with slimmer figures and a dramatically lower risk of developing type ii diabetes. Using data from the EPIC-Norfolk Study of 25,639 men and women ages 40-79 living in and around Norwich, England, researchers found that eating one or more portions of fish per week could reduce the risk of type 2 diabetes by 25 percent. These results were supported by a prior ecological study of 41 countries on five continents with different socio-demographic characteristics. The study also found that high fish intake may reduce the risk of type 2 diabetes in populations with a high prevalence of obesity. The study using the EPIC-Norfolk data by Patel et. al. controlled for a variety of lifestyle factors, including: physical activity, alcohol intake, smoking, plasma vitamin C levels or fruit and vegetable intake, and education level. While the studies adjusted for the influence of these variables, those who developed diabetes tended to be older and male, have a higher average BMI (Body Mass Index), were less physically active, and consumed fewer fruits and vegetables. The opposite (female, lower BMI, more active, higher fruit and veggie consumption) was generally true for those who ate one or more portions of fish per week and did not have diabetes. The news is not as encouraging for those with a fondness for shellfish like lobster and shrimp. In the Patel study, shellfish consumption produced markedly different results from eating fish. Rather than inhibit diabetes symptoms, eating one or more servings of shellfish per week actually increased the risk of developing diabetes by 36 percent. The researchers conducted statistical tests to confirm that this relationship could be attributed to the high cholesterol content of shellfish. It turns out that eating fish can also be a good way to drop a few extra pounds. Other research found a relationship between obesity and fish consumption. Study participants who consumed white or oily fish as part of calorie-restricted diet for eight weeks lost an average of 1 kg of body weight more than control subjects. Contrary to the link between obesity and development, Japan, one of the world’s most developed countries, has long held claim to the world’s longest life expectancy, which currently clocks in at more than 82 years. A remarkably low obesity rate of about 3 percent compared with 10 to 25 percent for most other developed countries has something to do with this achievement. Please refer back to the table above to compare Japan’s obesity incidence with those of other developed and developing countries. The secrets to Japanese longevity are frequently linked to a healthy diet centered around ample consumption of fish and tofu. Makiko Itoh of Just Hungry and Just Bento explains that trim Japanese bodies can also be attributed to smaller portions, more unplanned movement, and peer pressure from a culture that places a premium on “fitting comfortably and unabrasively into society.” Naomi Moriyama, co-author of Japanese Women Don’t Get Old or Fat: Secrets of My Mother’s Tokyo Kitchen , figures the average Japanese person eats about 25 percent fewer calories per day than the average American. According to Prof. Benjamin Senauer of the University of Minnesota, the average Japanese man walks four miles a day while nearly 25 percent of American adults walk only 1,000 to 3,000 steps per day (2,000 steps equates to about one mile for many people). Unfortunately, environmental health and human health do not always go hand-in-hand. Many fish with high omega 3 levels are high-level predators that consume large quantities of subordinate ocean species. 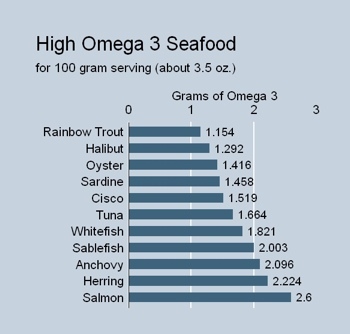 The chart below shows the omega 3 content for a selection of popular fish and seafood. The downside of increasing consumption of salmon, tuna and other fish at the top of the ocean food chain is a disproportionate impact on the marine environment that threatens the sustainability of sea life populations. According to Seafood Print, eating one pound of a top-level predator like salmon or bluefin tuna equates to eating 10 pounds of intermediate predators such as pollock and herring, 100 pounds of first-order consumers like anchovies or lobster, or 1000 pounds of primary producers like algae and phytoplankton. Several basic, yet powerful health lessons and policy recommendations follow directly from these findings. • Government agencies, health organizations, doctors, other medical practitioners, and health insurance providers should educate families and individuals on the important health benefits of consuming more than one portion of fish per week and limiting shellfish consumption to less than one serving per week. • People, organizations, and governments in cities and rapidly developing urban areas need to make conscious efforts to avoid the pitfalls of modernization and convenience by adopting and maintaining healthy eating, exercise, and other positive lifestyle habits. • Environment officials and organizations should teach consumers about the need to balance consumption of high-level predators like salmon and tuna with lower level species like pollock, herring, and anchovies to help ensure the sustainability of our ocean ecosystems and the global supply of natural, wild fish and seafood. What’s for Dinner: Sushi or Fish Sticks? The Developing World’s New Burden: Obesity. Food and Agriculture Organization. United Nations. Hossain, Parvez, Bisher Kawar, and Meguid El Nahas. Obesity and Diabetes in the Developing World — A Growing Challenge. The New England Journal of Medicine. January 18, 2007. IDF Diabetes Atlas. International Diabetes Foundation (IDF). Itoh, Makiko. Why Japanese People Are Slim, or At Least Don’t Get That Fat. CalorieLab. January 17, 2008. Nkondjock, A. and O. Receveur. Fish-Seafood consumption, Obesity, and Risk of Type 2 Diabetes: An Ecological Study. Diabetes & Metabolism. Volume 29, Issue 6. Pages 635-642. December 2003. Patel, Pinal S., Stephen J. Sharp, Robert N. Luben, Kay-Tee Khaw, Sheila A. Bingham, Nicholas J. Wareham, and Nita G. Forouhi. Association Between Type of Dietary Fish and Seafood Intake and the Risk of Incident Type 2 Diabetes. Diabetes Care. 32: 1857-1863. July 5, 2009. Robb, Douglas. Pregnant Mothers Intake of Omega 3 Key to Babies Big Brains. Health Habits. May 29, 2008. White Fish Associated with Lower Risk for Type 2 Diabetes. Diabetes in Control.com. October 20, 2009.